Update (10:48AM EST): Since drafting this original story, we’ve taken to several corners of the internet to find some more context for Adam Orth’s tweets. Since he has set his account to private, we’re relying on screenshots taken by fans with access. Which brings us to one of two separate shots. The first series of tweets come from before Adam Orth had his exchange with BioWare’s Manveer Heir. Here, from NeoGAF, is the screenshot. All of that comes without any provocation from Heir. Orth and Heir have now both taken to backtracking since the issue erupted on multiple outlets overnight and this morning. The next shot comes from Reddit. Orth and Heir are looking to right the collective ship. Again, watch out for profane language. It’s nothing major, but heads up for those in public places. It’s a little more harsh than the language used in the original post. The issue I take with these new tweets? Orth and Heir can back up all they want. 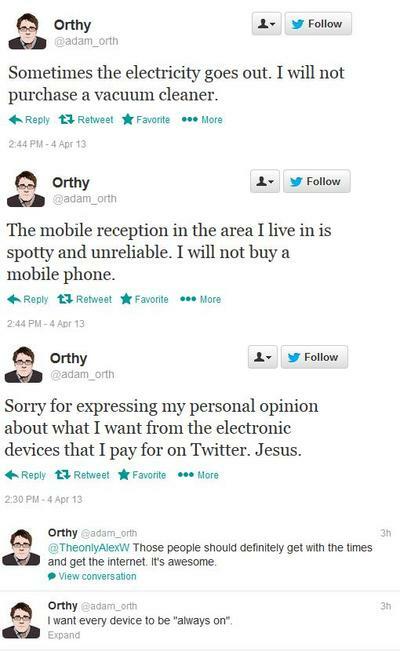 That only excuses the insulting manner in which Orth handled Heir’s line of questioning. The initial tweets, the tweets that now sit at the head of this post, were unprovoked. Orth, a representative of Microsoft Studios, claims that always-on gaming as a requirement is not a big deal. UPDATE 2 (2:51 P.M. EST) – Microsoft has now issued an official statement denouncing Orth’s comments. Original Story: Recently, the gaming world has been treated to a very scary circle of rumors: the next Xbox might require an always-on connection. The word is, as Kotaku recently reported, that the console will need to have an active internet connection to start games. If the connection drops for three minutes, the console boots players. This is a rumor. This has not been confirmed by Microsoft in any official capacity. It could, and hopefully will, turn out to be nothing but grade A malarkey. However, the swirling possibilities have pushed the internet into tons of conjecture. That conjecture has caused gamers and writers to pose criticism against Microsoft’s decision making. Now would be the worst time for an executive from the company to spout off nonsense about how silly consumers are, right? But lo, dear readers, Microsoft Studios Creative Director Adam Orth decided that he should voice his opinion about always-on consoles, and devices in general, on Twitter. In doing so, he angered a lot of consumers and, we assume, became the subject of a lot of internet ire. He’s since blocked his Twitter account, but that hasn’t stopped places like Reddit from taking screenshots of the account. 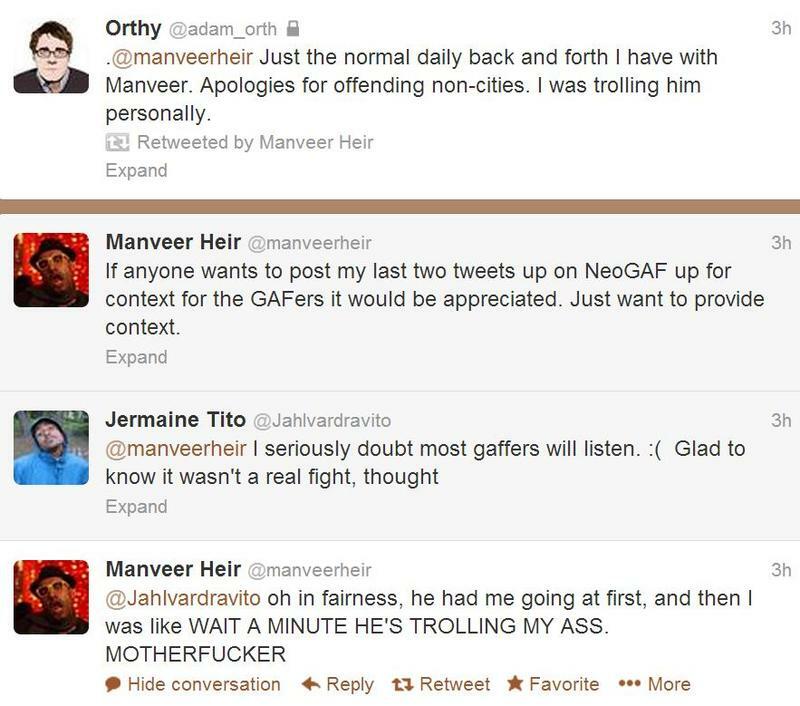 Orth is in a small discussion with BioWare’s Manveer Heir. Warning: There’s a line of profanity within. It’s not a big deal, but keep that in mind before scrolling down. 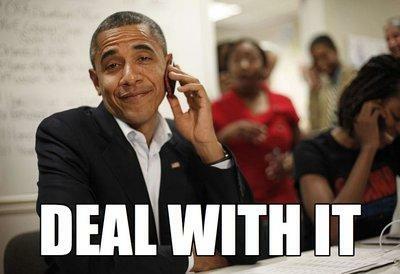 His stance of “get with the times” and “deal with it” is absolutely ludicrous. Just last night, I lost internet for nearly six hours. I live in a developed area of the US with stable electricity and relatively stable internet. For those six hours, I wouldn’t have been able to access anything that was always-on. As a gamer, as a writer and as a potential consumer for the next Xbox, I’m stunned. Completely stunned. I hope Mr. Orth was doing nothing but expressing his personal opinion. I hope Microsoft isn’t so misdirected that they release a gaming device that requires an internet connection to work. If they do, I’m out.